University can mean a new place, new people and new environment which is exciting! We want you to enjoy your new surrounding safely – Kent is a safe place to study and the risk of experiencing anything untoward is thankfully very low but here are some tips to looking after yourselves and others. Try to think ahead. Make sure someone knows where you are going, who you are meeting and when you expect to return. 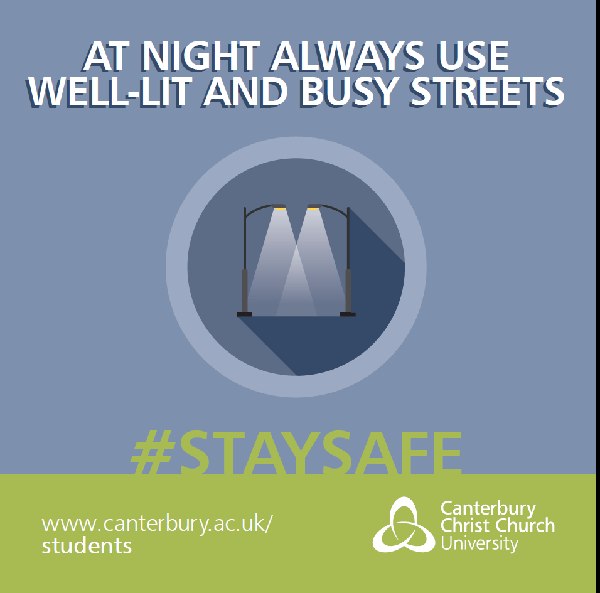 Avoid walking home alone at night and stick to well-lit streets and busy areas. Be alert. At night don’t walk listening to music or chatting on the phone. Stay in pairs. 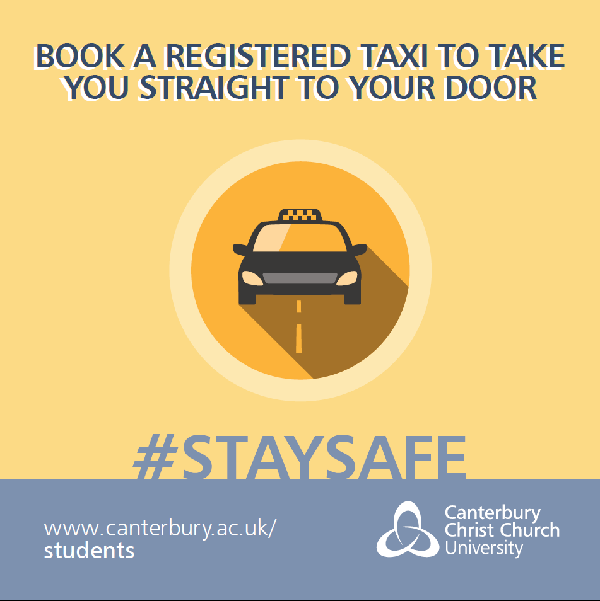 Share a taxi with friends and agree to text or phone each other when home safely. Always plan how you are going to get home again. Check the times of the last train or buses. Carry the telephone number of a trusted, licensed taxi or minicab company with you or have a suitable booking app available on your phone. 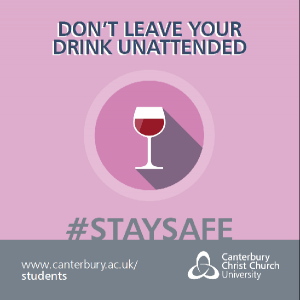 As a Purple Flag destination, Canterbury prides itself on its vibrant night time scene that is fun, welcoming and safe. Check out this online map which highlights the well-lit routes in the City. Don’t forget that there are CCTV cameras in all the subways which are monitored 24/7 for your safety. 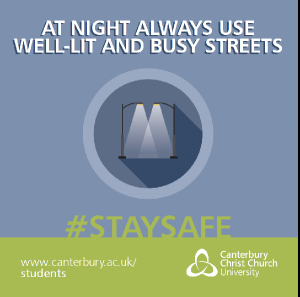 Say hello to our Street Marshals who here to help you get home safety on your nights out. For more details on the areas and times they cover visit canterburystreetmarshals.org . 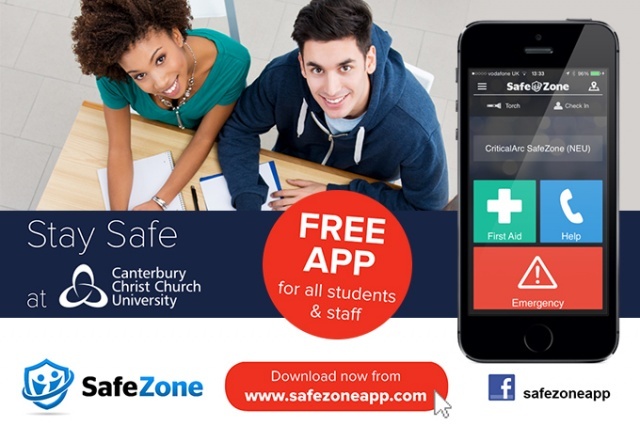 You can download SafeZone, a free new app for students that connects you to the University security team if you ever need urgent help, first aid or if you have an emergency while on any of our campuses. Click here for details . 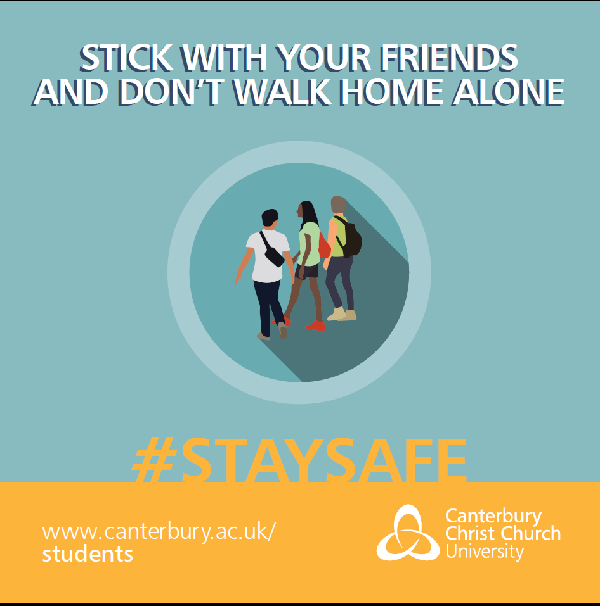 If you need any extra support or have concerns about your safety while studying at Canterbury Christ Church University, contact our trained specialist Student Support and Wellbeing Advisors on 01227 782675 or by email studentwellbeing@canterbury.ac.uk.